Water Country USA’s guests are in for an epic journey on the park’s newest thrill ride – Colossal Curl™, set to debut at Virginia’s largest water park this spring. Park officials announced details about the attraction today via Busch Gardens’ official YouTube channel. Visit www.youtube.com/buschgardensva to watch the official video as well as teaser videos the park released over the past several weeks leading to today’s announcement. Make sure to click on the subscribe button to stay up-to-date on Colossal Curl developments. True to its name, this mega slide promises to deliver a high-adrenaline, action-packed adventure. 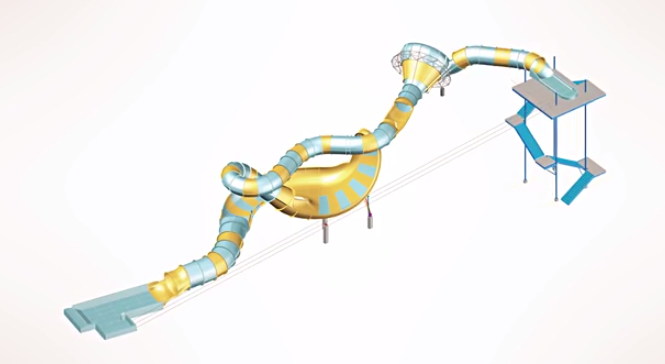 Colossal Curl features a funnel element that will swish and swirl guests before whisking them through the ride’s enclosed colorful tubes on their way to a wave element that hurtles them high above the park. Colossal Curl is being built near the park’s main guest entrance. Construction will begin by the end of the year. By spring, many of the ride’s features will be visible to guests as they arrive at the park. Water Country USA Vice President Jeff Thomas said the company decided to build Colossal Curl because of increased guest interest for the park’s first family thrill attraction. Colossal Curl will have the same 48-inch ride height as Vanish Point®, which opened in 2011 and has thrilled guests with its drop-away floors and speed slides. “Vanish Point was our first big thrill slide that had riders saying ‘Wow’ and Colossal Curl will now will get the same reaction,” Thomas added. Theme park fans began speculating about a new attraction on Oct. 28 when the first of three teaser videos appeared on Water Country USA and Busch Gardens official social media sites. Click here to view the videos. Colossal Curl will be making a splash at Water Country USA in spring 2014. For more information, visit www.watercountryusa.com/colossalcurl.